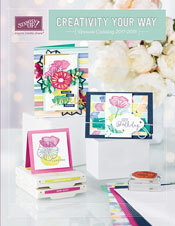 Welcome back to my blog for my third December 2012 Stampin' Up Artisan Design Team projects. I love divided page protectors, and in addition to receiving a beautiful linen 12x12 scrapbook this month I also received a packet of the divided page protectors. I love the idea of doing a December Days project, so I decided to do that with a few of the divided page protectors. I also used the Snowflake Season Simply Scrappin' Layout Kit. I bought two: one to use as is, and one to cut up for this project. I made a 12x6 opening page spread on the page with three vertical pictures, and made another 6x12 closing page scpread on the page with three horizontal pictures. Here is the first page. I need to add a picture to the red rectangle, and also write on the tag. I am going to add some more details and pictures to the back of the spread as well. I did some light editing of my pictures, and also added some text with the date before printing them. Here is the next page. I am planning to add our Christmas dinner menu to one of the white sheets clipped on, and a list of Christmas gifts I received to the other white sheet. I also have more pictures to add to the back of this spread. The other page protector that I love is the one with 9 4"x4" squares, which is just perfect for Instragram pictures. I'm going to be printing those out, and adding them to my pages along with some additional cards from restaurants where we ate and other trinkets from December. I plan to finish this up next week, and will post some more pictures with the completed project. I had grand plans to complete this while I was out of town for vacation, but you know how the holidays sometimes go! (Let's just say that my Christmas cards will now be New Year's cards!) This project was also a trial run to see if I could handle doing this on a monthy basis for a whole year. I'll talk more about that next week as well as the new year starts out! Well, thanks for stopping by. I hope you had a wonderful Christmas with friends and loved ones. I'll also be back soon with my December Artisan Design Team Facebook project. I believe those will be posted on January the 4th. Thanks! Welcome back for the second part of my Artisan Design Team December 2012 projects. Today I have a set of cards to share with you that can be used for various occasions throughout the year. I took the Morning Post Alphabet, and made focal points with them for my cards. I used the Teeny Tiny Wishes set for the full greetings underneath the banner. I added some tabs with the 1/4" Stitched Grosgrain Ribbon and buttons from the Designer Buttons Brights Collection. The colors I used are Real Red, Daffodil Delight and Rich Razzleberry. The Polka Dot Designer Series Paper makes another apearance too. Here is the set of all three together. Here is a close-up of the Thank You card in Daffodil Delight and Real Red. And, a close-up of the Happy Birthday card in Real Red and Rich Razzleberry. And, the For You card in Rich Razzleberry and Daffodil Delight. Thanks for stopping by. I hope you can join me again tomorrow. I am working on a December Everyday album using the divided page protectors and a scrapbook page kit from the Holiday Mini. Thanks! Last year I had a card published in the PaperCrafts November-December 2011 issue, and I never got around to sharing it. I used the Stampin' Up set Tags til Christmas and the matching ornament punch, twine, gems and some non-SU patterned paper. It's a great card, and easily reproducable. I also took the punched out patterned paper ornament, and made a gift tag with it. I decided to remake the card and tag using only Stampin' Up supplies. I used the Delightful Decorations stamps set, the same ornament punch, more baker's twine and the Festival Of Prints Designer Series Paper Stack from this year's Holiday Mini catalog. Since it was so easy, I made a few more! Here are closeups of each of the cards. The stamped ornament was punched out, and attached to the inside of the card in alignment with the punched ornament on the front layer. I also stamped a small circular element for the center of each ornament, popped it up with Stampin' Dimensionals and added pearls. The bakers twine and patterned paper are the finishing touches. Here are the tags that I created with the punched out ornaments. I added a strip of patterned paper to the top of the tags this time. Love that stack of patterned papers! Well, I hope you enjoyed these projects. Thanks for stopping by. Supplies are listed below! Every year I make my own Christmas cards to send out, about 70 or so of them. They were completely paper crafted, and I included a letter with pictures about my year which I also printed at home. I think they were all beautiful, and enjoyed making each batch. But, they often didn't make it to the recipient by the end of December...or sometimes January...but usually by the end of February! Last December, I decided to give My Digital Studio a try for making the letter with pictures portion, and design something simple to wrap the digital card with. I loved the results! And, the best part, I had them all sent out before I went to Kansas City to celebrate Christmas. Today, I thought I would share my hybrid project for you all to enjoy. This is the "wrapper" with the digital card inside. I cut an 8 1/2 x 11 piece of Vellum Cardstock in half lengthwise, and folded it in half. Then I embossed it with the Northern Flurry Textured Impressions Embossing Folder, and used Dazzling Details on the centers of the snowflakes (hard to see in this picture). I stamped the front of the card with the greeting from last year's holiday catalog (Hand-Penned Holidays) using Cherry Cobbler ink. I then wrapper the vellum around the card, and punched a 1/8" circle just past the edge of the digital card. I put the digital card inside, and tied on the Cherry Cobbler Baker's Twine. Easy peasy! Now, for the digital portion. I used elements from the Downtown Grunge Photobook Template, the Lots of Tags Shape 2 Punch, Old Saint Nick Stamp Brush Set, and the Winter Post Stamp Brush Set. I also used a couple of digital stamps from Ali Edwards. So, this view shows the "back" and outside of the card. This view shows the "front" and inside of the card. I also used Merry & Type Stamp Brush Set, the Medallion Stamp Brush Set, some digital brads and pearls, and the Christmas Cocoa Ii Digital Kit. I think that is most of the supplies! I was very impressed with how well these looked when printed out. The quality is excellent. Right now I am working on this year's version. There will definitely be another MDS tri-fold card, and probably another simple vellum wrapper. Thanks for stopping by! I have lots more holiday goodness up my sleeve in the coming days, so come back for more! Even though it doesn't feel like Christmas here in Illinois (it was 66 today and foggy, rainy and humid! ), it is beginning to look a lot like Christmas. There are lights going up on houses and business, and I had my work Holiday party on Saturday. Christmas music is even playing on my XM radio in the car. I received this tulle in my November box from Stampin' Up, and wanted to try making some large flowers to use on gifts. The first one uses the Cherry Cobble Scalloped Tulle Ribbon. I started at the outer edge of the Jumbo Sticky Rounds, gathering extra ribbon as I went. Oh, and the ribbon is folded in half, and I am working with the folded half to the inside. As I neared the center, I tightened up the gathering so the inner flower stands up a little bit. This one also has embossed cardstock cut with the scalloped circle punch, Vintage Faceted Designer buttons and some Cherry Cobbler twine. For this one, I started at the outside edge with the ribbon folded in half again. I stopped when I had covered about half of the sticky round. Then, I started at the center, twisted the ribbon tightly, and wound it around until it met the other ribbon. I finished this one with a bronze button and some Early Espresso baker's twine. For this last one, I created loops around the the outer rows with Early Espresso Scalloped Tulle Ribbon. Then, I wound a few rows inside of the loops, and finished the flower with a paper daisy, a wooden button and some Whisper White baker's twine. We celebrated my brother's birthday just before Thanksgiving this year, and we used the Early Espresso bow on his package. My mom helped, and even stamped on the outside of the package on the kraft paper with brown ink. The tulle makes a great ribbon to wrap the package with also. So, that's it for today. Thanks for visiting. Come back the rest of this week. I have a couple of Christmas cards and other projects to share!